The biggest, most influential magazine of the Brazilian glass sector. For over 50 years, O Vidroplano presents in its pages all the latest news on the glass world. The magazine is a technical reference with credibility among the professionals of the sector in Brazil and in Latin America. Created in 1957 by the Syndicate of the Rio de Janeiro Flat Glass, Crystals and Mirrors Wholesale Trade (Sincavidro) and edited since 1991 by Abravidro, O Vidroplano presents every month the development and innovation of the market in Brazil and abroad. There are special, technical news articles, trends, articles about architecture, national and international events coverage and data from the market in extensively investigated news reports and with appealing graphical design. – Audited circulation: the audit is conducted by BDO Trevisan Auditores Independentes, an international reference on the subject. – Defined circulation date: it assures the efficiency of its communication strategy in preestablished deadlines. – High printing quality: conducted by the most awarded printing works in Brazil, O Vidroplano counts with the Forest Stewardship Council (FSC) stamp, which guarantees the rational use of forests. 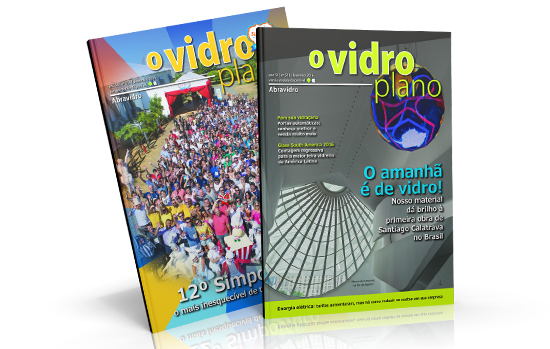 – Dgital version: besides the printed magazine, O Vidroplano also has its digital edition, multiplying the number of readers of the publication. The Internet user access the magazine in the web with agility and also counts with a tool to research specific subjects. In this version, all the ads include a direct link to the advertiser company’s website.